The SVBIEDs used by the Islamic State (IS) throughout the years have come in all different sizes. Everything from sedans, to pick-up trucks, heavy transport trucks, heavy construction equipment, and military armoured vehicles have been converted into rolling bombs. While large shell vehicles have been relatively common, there’s one rare category of vehicles completely unmatched both in its absurd size and obscurity — the mining haul trucks. There has only been 3 recorded cases of IS using this vehicle type in SVBIED attacks, ever. In this article I will be detailing all available information about these attacks, beginning with the first example in August, 2015. In late May 2015, IS managed to seize the strategic town of Khunayfis, located approximately 60 kilometres to the Southwest of Palmyra in the central Syrian desert of Homs province. Along with the town, IS militants also seized the Khunayfis phosphate mine. The mine is one of two in the area, with the other one located at al-Sharqiyah/as-Sawwanah. 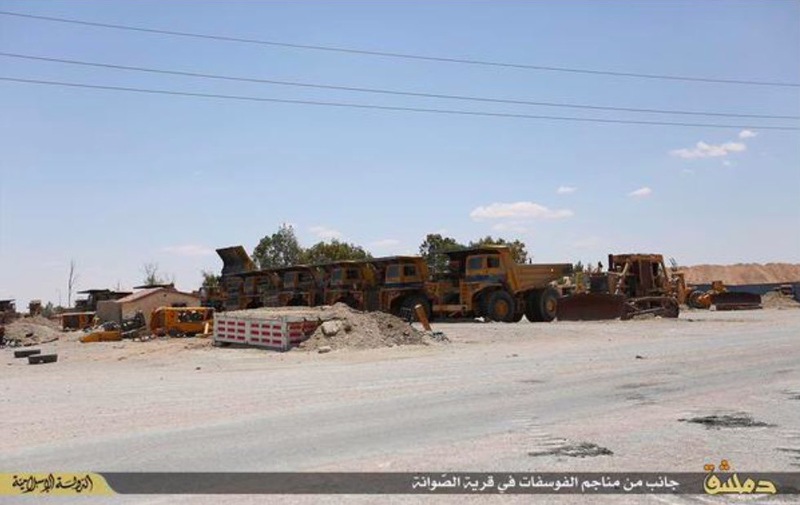 In a photo released by IS from the Sawwanah facility which was also captured around the same time, at least 6 Belarusian-made Belaz haul trucks could be seen lined up. These massive vehicles are traditionally employed in large mining operations, but IS would find a much more destructive use for them. 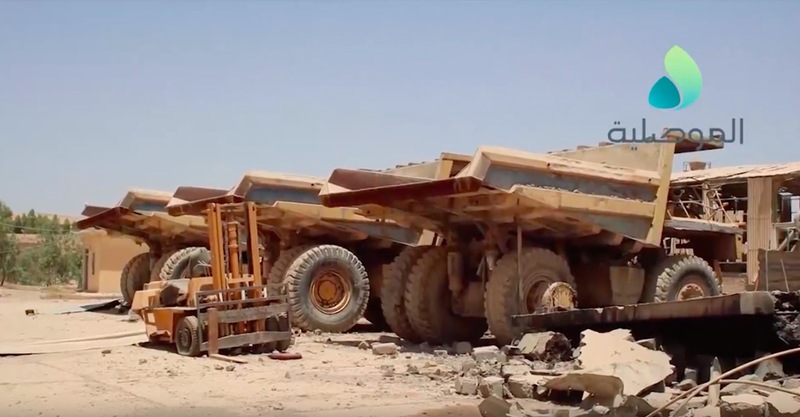 In the spirit of experimentation and not letting anything go to waste, IS decided to move one of these Belaz haul trucks to one of their workshops near the town of al-Qaryatayn, where it would be overhauled to function as an SVBIED. It’s unclear whether the chosen haul truck was taken from Khunayfis or al-Sharqiyah/as-Sawwanah. A photo taken during the manufacturing process showed that the massive vehicle had been plastered with a primary layer of improvised frontal armour in the form of metal sheets, and a secondary layer of improvised slat armour on top. At the time of the photo, the driver’s cabin had not yet been up-armoured. On August 19th 2015, the finished haul truck SVBIED was featured in an official IS photo report. With the addition of improvised metal sheets, armoured glass, as well as slat armour to the driver’s cabin, the vehicle was ready to depart on its mission. 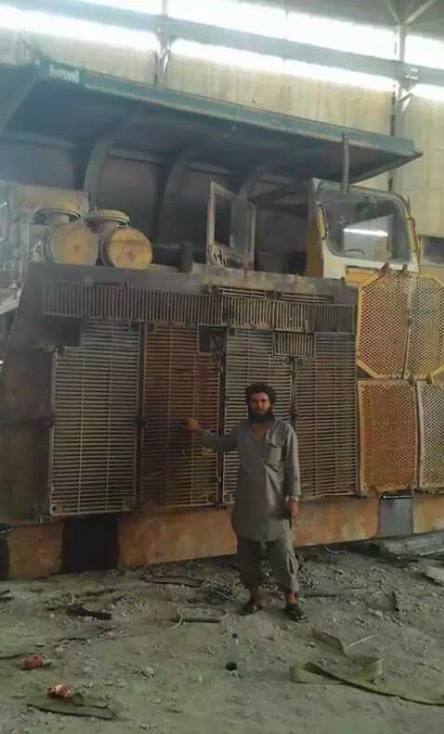 In one of the photos, the driver of the SVBIED (“Abu Abdullah al-Ansari”) could be seen posing in front of the haul truck. According to IS themselves, the haul truck had been fitted with a hefty explosive payload weighing in at 8 tons. The chosen target for this monstrous SVBIED was the Syrian loyalist-controlled Mafraq checkpoint, located Northeast of al-Qaryatayn. Although the operation itself wasn’t shown in a video, a distant night vision photograph of the detonation was included in the photo report. 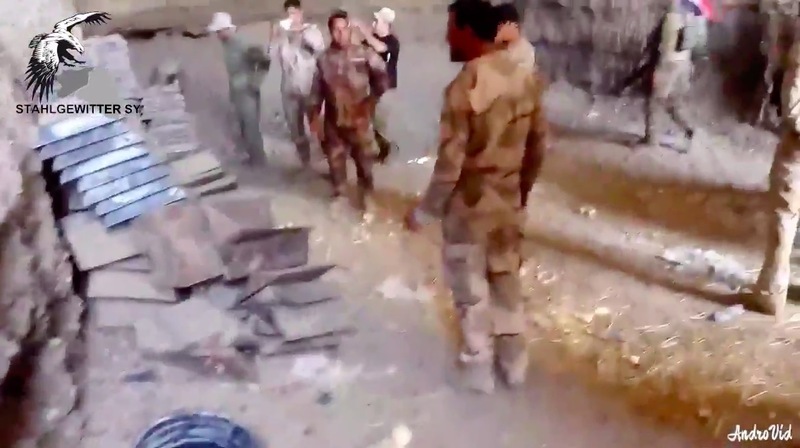 In late January 2017, an Iraqi fighter uploaded a remarkable video. 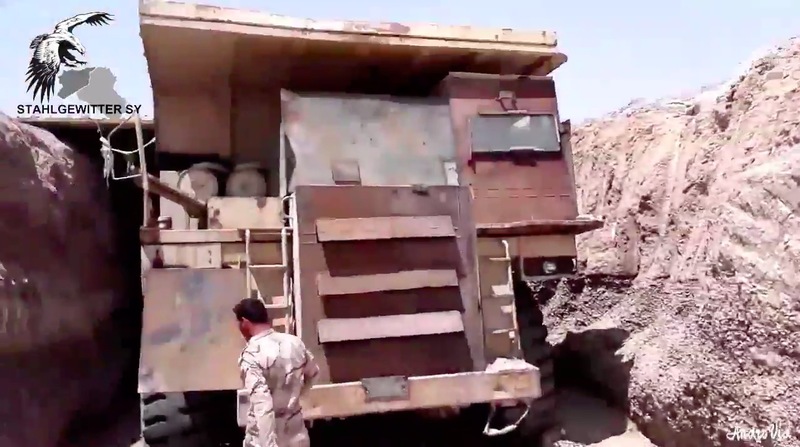 The 2-minute long video, shot somewhere in Iraq’s Anbar desert, featured the second recorded example of a Belaz haul truck converted into an up-armoured SVBIED. The frontal armour mounted on this haul truck appeared a lot more reserved and inconspicuous than that of its predecessor. Instead of applying a wall of metal sheets to the front, smaller sections had been mounted to key areas. For example, a large centre piece metal sheet shielded the engine. The slats in the sheet were purposely designed to prevent the engine from overheating. A smaller piece of improvised armour was also mounted in front of the right-side set of frontal wheels. The driver’s cabin was the most heavily shielded, with large metal sheets and armoured glass protecting the driver. This change in armour placement is actually fairly logical. The engine, driver’s cabin, and wheels are the weakest points on the haul truck. Hence, most of the work put in to overhaul the vehicle focused on these 3 crucial areas. 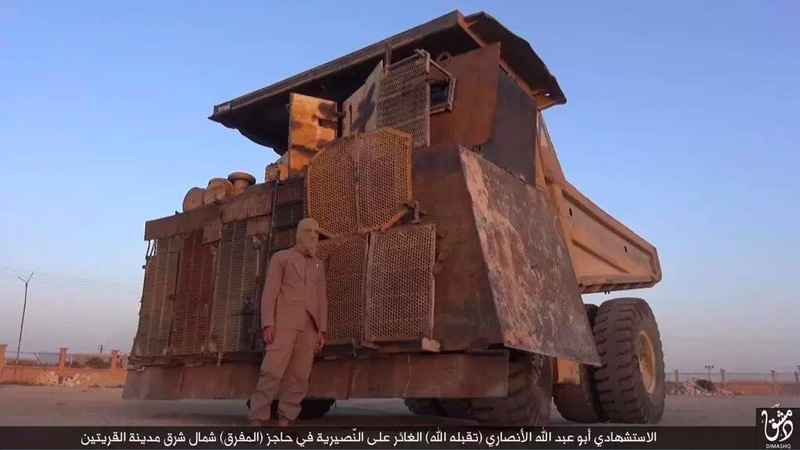 However, seeing as this haul truck SVBIED was captured before it could be employed in battle, it’s unclear whether more armour additions were intended. a smaller piece of improvised armour mounted in front of he left-side set of frontal wheels seem to be the only component missing though. The overhauled haul truck was found parked at the lower end of a ramp leading into a large desert dug-out. Looking at the vehicle from inside the underground storage facility, it appeared far more imposing. The video also included a short look at the rather large explosive payload. The payload consisted of a series of explosive-filled jugs, barrels and gas tanks wired together. 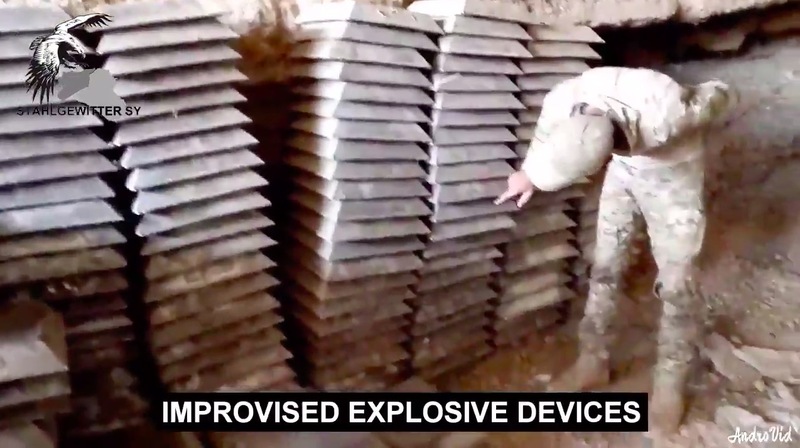 Taking into account the size of the rear bed of the haul truck, there was likely more than one layer of IEDs. However, the top layer alone was quite impressive. 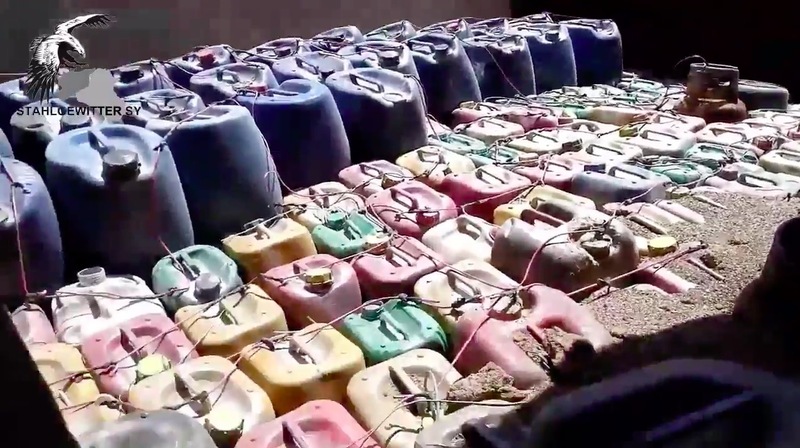 I estimate the top layer alone consisting of at least 30 large jugs (blue), around 100 smaller jugs (white/yellow/red/green), and 3 gas tanks. Seeing as we don’t know exactly how much explosives were contained in each jug, it’s difficult to get a precise estimate of the weight of the payload. Other than storing this massive up-armoured SVBIED, the desert dug-out also contained a sizeable anti-personnel IED cache. 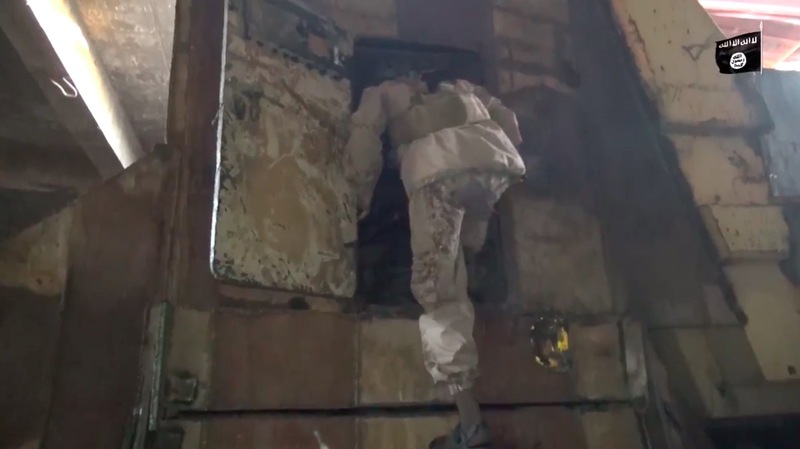 More than 100 standardised pressure plate IEDs were discovered at this specific site. But, where was the Belaz haul truck sourced from this time? 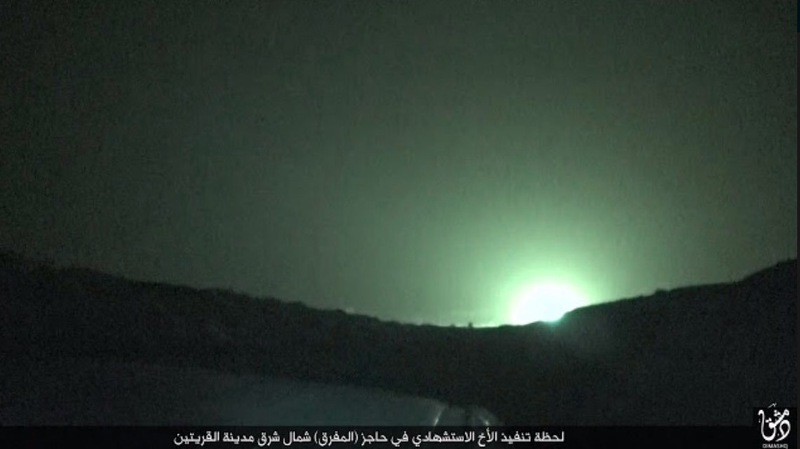 The video itself didn’t provide specifics as to where the SVBIED was seized other than it being in Anbar province. 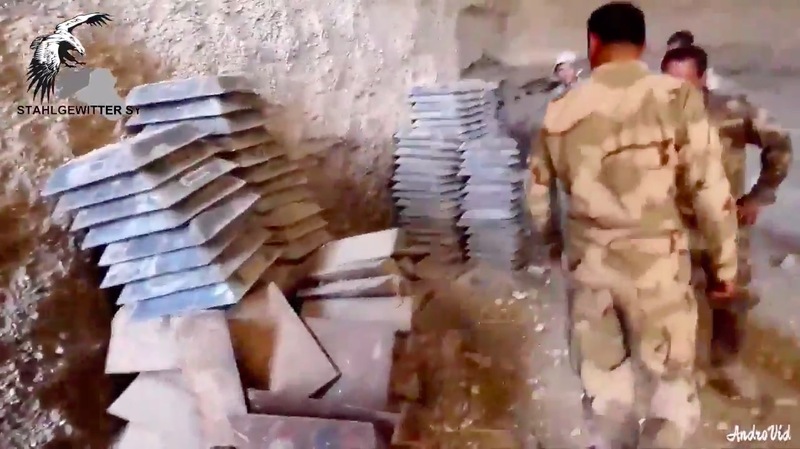 However, there are a number of large mining operations in Anbar province previously under IS control where it could have been taken from originally, including the Akashat facility. As the battle for Western Mosul entered its final stages in May 2017, the remaining IS contingent put up a fierce defence. 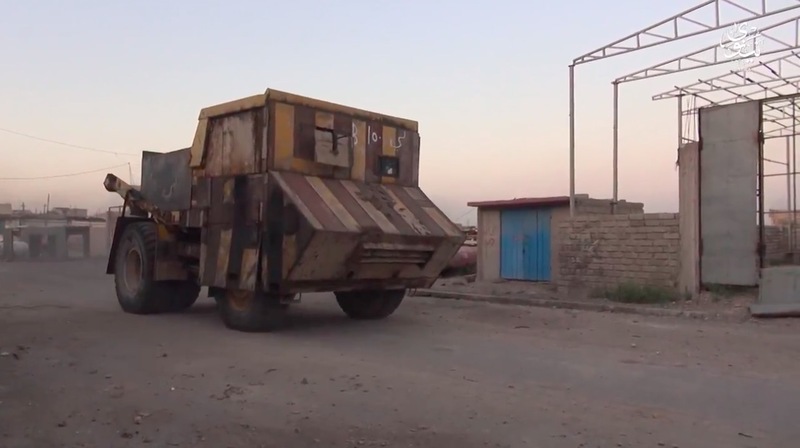 In an official video released by IS in mid-May 2017, the third and final example of an up-armoured haul truck SVBIED was featured along with a series of other standardised SVBIEDs. The armour placement on this example was noticeably more refined and all-encompassing compared to the previous two examples. A series of inter-connected metal plates covered the entire front of the vehicle. Angled armour with air intakes shielded the engine, and a piece of armoured glass acted as a viewing port for the driver as per usual. Furthermore, both sides of the original rear bed had been removed in favour of an improvised metal sheet. This example was also the first to have been fitted with rear armour shielding the rear wheel sets from incoming fire. Identical writings in Arabic on both the frontal armour above the driver’s viewing port and on the rear bed side armour could be roughly translated into “B150” — a unique identifying serial number. 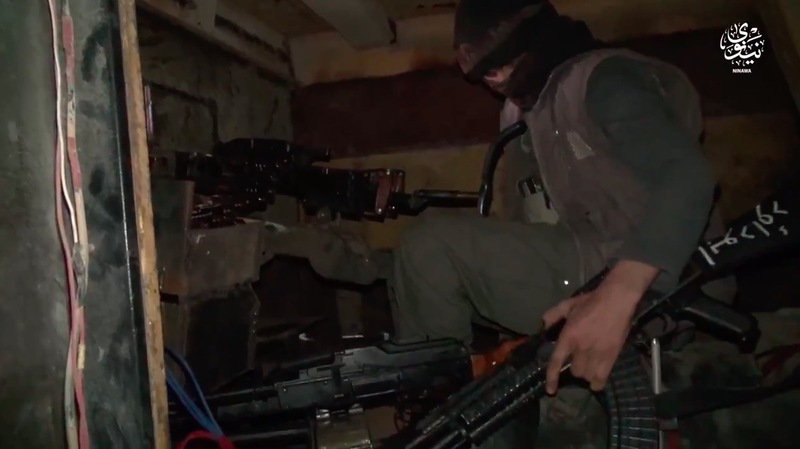 You might already have noticed, but the frontal armour of the vehicle also had an HMG emplacement protruding next to the driver’s viewing port, meaning that this was in fact a 2-man SVBIED. The video that this example was featured in actually featured very short snippets of the interior, offering a clue as to how it was set up. In the first section, an IS fighter could be seen climbing up into the vehicle. A look at the driver’s seat showed the armoured glass from the inside, and also provided a glimpse of the white box detonation mechanism mounted next to the steering wheel on the right, The gunner of this 2-man SVBIED was positioned in the next room, protected by improvised metal armour on all sides. According to Calibre Obscura, an expert on identifying small arms, the primary armament was a Chinese-made 12.7mm W85 heavy machine gun fixed on what looked like an improvised pintle mount. The secondary armaments included both a Soviet PK machine gun, as well as what appeared to be a Bulgarian AK-type rifle. Now, where did IS source this vehicle from? It definitely wasn’t transported all the way from Anbar province. Conveniently enough, the previously IS-controlled Badush cement plant, located approximately 20 kilometres Northwest of W. Mosul operated multiple Belaz haul trucks. 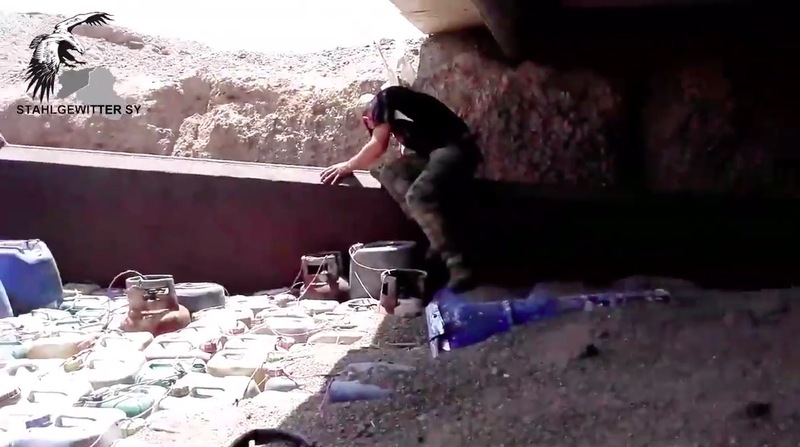 When the Iraqi army recaptured the cement plant in June 2017, what remained of the facility and its vehicles was documented in a video by al-Mawsliya TV. The “B” in the identifying serial number of this example (“B150”) may also have been a reference to its origin, the Badush plant. 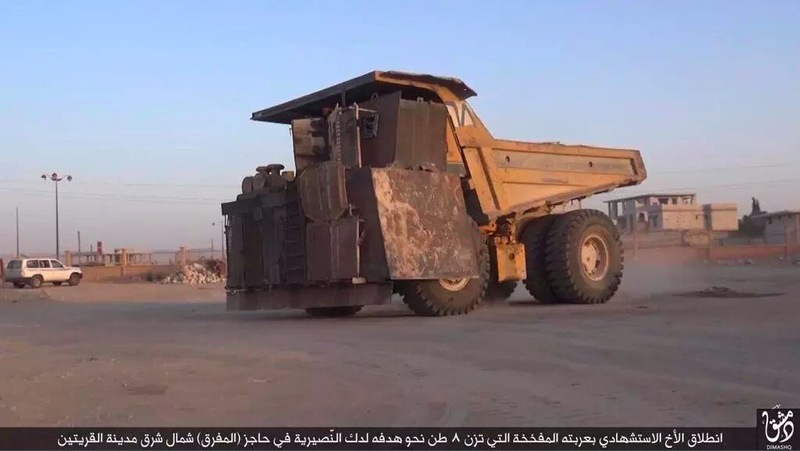 The real question here is whether using gigantic haul trucks as SVBIED shells serves a purpose other than an aesthetic one. Because, let’s face it – The ones that have been recorded really do look impressive. Looking beyond that, the efficiency of using this type of SVBIED is very questionable. Firstly, it doesn’t really make sense to use such a massive shell vehicle as a vessel to carry explosives. When you have a smaller shell vehicle, such as a pick-up truck or even a heavy truck, the vehicle itself acts as more shrapnel and debris upon detonation. However, the bigger and heavier the shell vehicle is, the more explosives is required in order to render it a viable option. For example, mining haul trucks weigh in at around 45 tons, an absurd weight. When you use it as an SVBIED, the frame of the vehicle will absorb a lot of the explosive energy of the payload upon detonation. 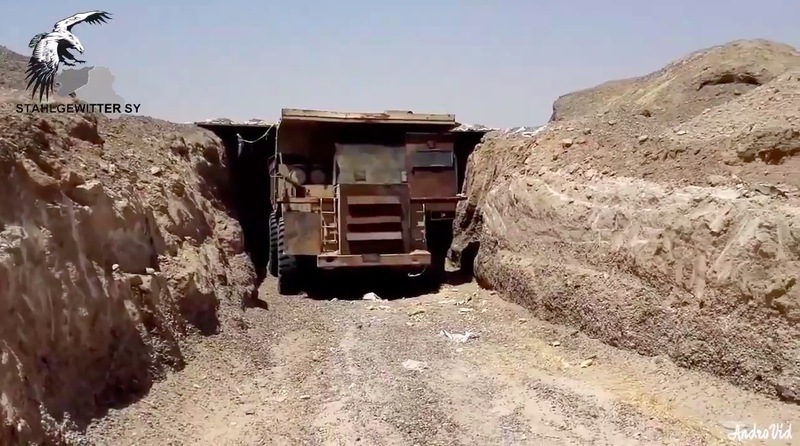 And while IS claimed that the first haul truck SVBIED had an explosive payload of 8 tons, it’s not really that much when you account for the weight of the haul truck itself and the explosives required to tear it apart. The comparatively smaller category of heavy trucks can still carry payloads of the same weight class, and they don’t carry with them the problem of the frame of the vehicle itself being too large. In this aspect, there’s no logic at all to using haul trucks. 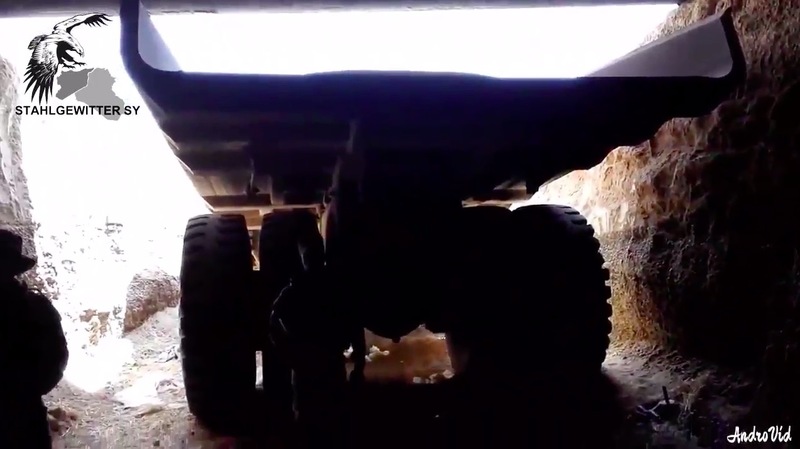 The large size and weight of the haul trucks presents another issue as well. Their slow speed, combined with their large profile, means that they’ll be large targets advancing toward their targets slowly. This means that the opposing force will have a lot more time to fire on a much larger target than when compared to a standardised pick-up truck or heavy truck SVBIED. 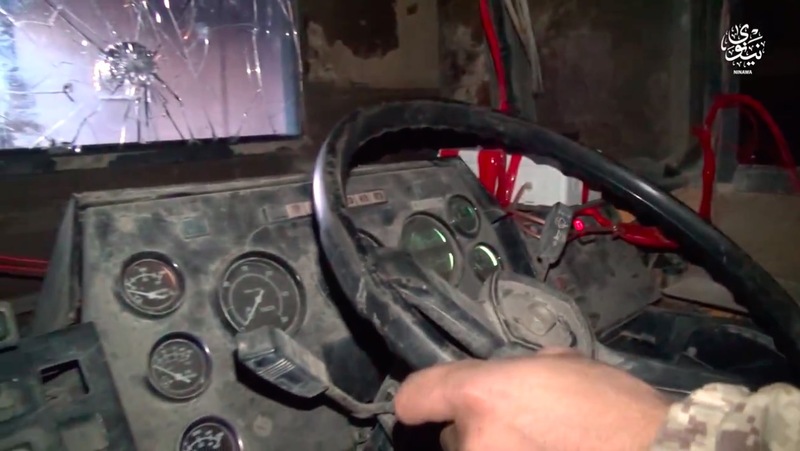 That may have been the reason why IS decided to conduct their first haul truck SVBIED attack during the night. Still, it’s not a logical SVBIED shell choice. As far as I can tell, there are two likely reasons for using this type of SVBIED shell. The first is the fear-inducing aspect. Considering that normal-sized SVBIEDs are known for the detrimental psychological effect they can cast on their targets, seeing an SVBIED as enormous as this driving towards you must be a chilling experience. The only other reason I can imagine for using this type of SVBIED is the propaganda aspect. Reiterating what I mentioned previously, the vehicles look very impressive and imposing. The question that arises then is why each successful recorded example hasn’t been featured more prominently in official IS media. In summary, regardless of the logic (or lack thereof) behind the repeated but limited use of this SVBIED type, it still remains as quite an impressive feat. And as with most other SVBIED designs, the progressive refinement process of the armour placement is also visible. 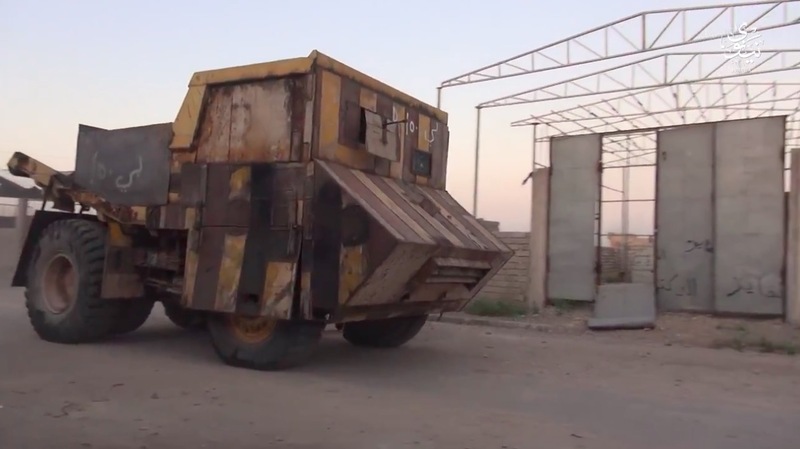 The use of these up-armoured SVBIEDs can be seen as a product of the vast territorial “caliphate” and the mass-production of SVBIEDs that came with it. The recent territorial defeat of IS means that it’s unlikely that we’ll see similar cases any time in the near future.